Drummer and teacher, he studied at the jazz seminars of Nuoro and graduated at the Conservatory “L. Canepa Sassari” in Drums and Percussion Jazz studies. He has played in various musical contexts from Jazz to Rock, from Brazilian to Cuban and African music. 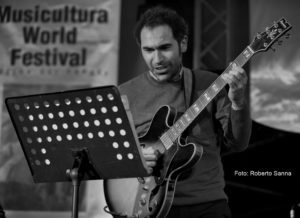 He has performed in several festivals in Sardinia and the peninsula (Cala Gonone Jazz Festival, “Festival Internazionale Animanera Mediterranea” in Nuoro, “Musica sulle Bocche” in Santa Teresa di Gallura, Festival “Terre Sonore” in Ozieri, “Festival EMMAS” in Olbia, “Festival Internazionale di Villa Celimontana” in Rome, “Premio Nazionale delle Arti” in Messina and many others). In 2006 he recorded with the band CUBACUBA the CD “Alguer en vivo” and with the jazz trio Do.de.ca.foni the entire soundtrack of the documentary “Air” by the director David Carrari, distributed by MONTURA EDITING and first prize of the Cervinia Film Festival 2009. He has taught drums and percussion since 2003, both in secondary schools, including the Liceo Musicale “Satta” of Nuoro, and the Music Schools of Nuoro, Orosei and Orani. He currently plays with a band of African and Cuban percussions, Kangbè, and he is the Jazz Orchestra “CalaGononeJazz Collective” drummer with which has collaborated Gavino Murgia, Antonio Ciacca, Alice Ricciardi and Lutalo “Sweet Lu” Olutosin and with which he recorded a album that is coming out soon. After a self-taught period at the age of 17, in 2000 he began to study at the C.P.M. in Milan where he met his current teacher Attilio Zanchi. He participated in several jazz masterclass, including Ronciglione with Buster Williams in 2006 and Castelarquato with Paolino Dalla Porta and Attilio Zanchi in 2007. In 2007 he also attended the jazz seminars by Paolo Fresu in Nuoro. In 2010 he graduated at the Conservatory “G. Verdi” in Milan. 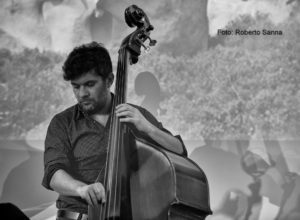 As a doble bassist and electric bassist he has collaborated in several songwriting music projects, both soul / jazz and jazz. With Maria Lapi (www.marialapi.com) he has participated in some important music events, such as Mantova Music Festival. With Koinejazz trio (www.koinejazz.com) he has performed some of his original compositions and won a national competition in Bordighera in 2008. He also played at the final of the music competition “Chicco Bettinardi” in Piacenza. In 2012 he won the Padua Porsche Jazz Festival-by the pool. He has participated in several television and radio programs, including “Top of the Pops (RAI), on different radio stations (Radio Montecarlo, Radio 105). He regularly performs in clubs and festivals in Italy and Switzerland. Born in 1982, he started studying classical music at the age of 10 with the teacher G.Porqueddu. From the age of 14 to18, he played many concerts in several cultural contexts and elaborated soundtracks for theater performances. 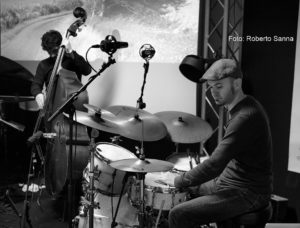 The following years are characterized by a keen interest in “progressive rock” and the need to deepen the blues-jazz style, which is why he has attended the “Seminar Nuoro Jazz” by Paolo Fresu and various master classes, including those of Umberto Fiorentino and Franco Cerri. He has played in different jazz and funky-jazz bands (quartets and quintets), both as a leader and as a sideman, and has participated in festivals and concerts in clubs. Between 2013 and 2014 he moved to Sweden where he had the opportunity to work with classical and jazz musicians and played in the most important Stockholm jazz clubs, including the “Fasching Jazz Club”.